In April, construction began on Superior Street; today the road has been dug up and new bricks are being laid down. The new road will allow for bikers and pedestrians to have a safer route and is a big part of Albion revitalizing downtown. When all of the projects along Superior Street are completed there will be a huge draw to that area of Albion, but for now the project, not scheduled to be completed for another few months, is hurting businesses. Cascarelli’s in particular has been affected by the road construction. I stopped by mid-afternoon and was able to talk with Jim Cascarelli, the restaurant’s owner, around him ringing up the one customer. Access to the building is the first of many problems to have affected the business. In order to keep pedestrians away from construction equipment, barrier walls have been put up to divide the sidewalk in half, allowing people to walk close to the buildings. In order to cross intersections people need to walk about 10 feet down a side road, cross and then walk back. Areas where pedestrians can cross Superior are even rarer. He feels the business has lost 35 to 40 percent of people traffic since the construction started and well over half of the senior citizen traffic they normally get. Most of them would park right out front or on the side street closest to the restaurant’s side entrance. It provided paved roads and sidewalks for them to walk on, which is more stable footing than the sloped gravel parking lot behind the business. Many of the setbacks the road project has faced have also impacted the restaurant. “We’ve been shut down nine times from water main breaks, to storm sewers not being properly connected, to flooding of the basement, to losing our computers because of the water damage and moisture,” said Cascarelli. When the water mains were shut off to make repairs, it meant there was no fresh water to wash dishes or for food prep or employees washing their hands, which meant the restaurant had to close. One of the first days the restaurant was forced to shut down was the day of Albion College’s Commencement. Besides missing out on customers from Commencement, the road is not expected to be completed for Festival of the Forks or Albion College’s Homecoming – Cascarelli’s two busiest times. That’s not to say other businesses haven’t been affected either. According to an MLive.com interview, The Bohm had to shut down the first day “Guardians of the Galaxy Vol. 2” was open due to sediment in the water after the mains turned on again. Jim and Staci Stuart, co-owners of Stirling Books and Brew, are in a unique situation because they haven’t owned a business when there wasn’t road construction going on. “Maybe [the construction is] even a blessing for us because we’re new…it gives us a chance to kind of get used to things without being overwhelmed,” said Jim Stuart. Of course, they recognize how the construction can leave businesses not feeling the same way. Over the summer, the Stuarts saw a post made by Jim Cascarelli’s daughter about some of the struggles the restaurant has had, so they created a Facebook event called Albion Cares for Cascarelli’s. The event brought a decent-sized crowd and most importantly let the Cascarelli’s know people care. As construction continues for the next few months, supporting the downtown businesses and showing our support and care is vital, even if it means walking a bit out of the way. “We have worked with the Chamber and MDOT to help publicize alternative routes and available parking at the rear of buildings downtown. 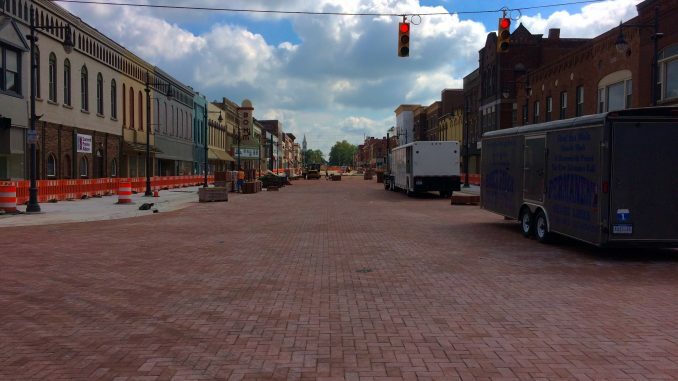 We are looking forward to planning a ‘Block Party’ to celebrate the new brick street and promote our downtown businesses,” said Sheryl Mitchell, Albion’s City Planner. According to Mitchell, the road south of Cass Street is expected to be completed by early October and north of Cass Street completed by the end of November. Well written and great job getting the opinions of local business owners!